Web Inspector blacklist monitoring is an automated, daily check to make sure that your website is not blacklisted by any major search engine or anti-malware organization. Apart from the blacklists run by major search engines, there are also blacklists for Spam email, DNS, Phishing and many more. Comodo Web Inspector checks all of these blacklists every day to make sure your website is not listed. If it is, you will be immediately alerted so that you can take remedial action. How should I subscribe for daily malware scanning? Select the plan that best suits you from the 'Plans & Pricing' page, fill in your details and you will be setup in no time! Malware (short for "malicious software") is any harmful program or file intended to secretly access a computer or steal confidential user data. The umbrella term 'Malware' covers computer viruses, worms, Trojan horses, spyware etc. Malware may be served as hidden codes within a website content, served content like banners, advertisements etc. and used as a vehicle for hacking and other cyber-crime. Traditionally, malware was only 'activated' as a result of the user proactively opening an infected file. For example, opening an email attachment or double clicking on an executable that had been downloaded from the Internet. Unfortunately, hackers have become much more sophisticated over recent years and this level of interaction is no longer required. Hackers can now launch attacks over the Internet - attacks that are triggered simply because the user visited the website. In some cases, these 'drive-by attacks' often use served ads as a vehicle for delivery. How can a website infect my PC? The 'Drive-by-Download' Attack: The 'drive-by-download' attacks occur when a visitor navigates to a site that injects malware onto the victim's PC. Crucially, these attacks are usually downloaded and run in the background in a manner that is invisible to the user - and without them taking any 'action steps' to initiate the attack ( for example, erroneously downloading a file that later transpires to be malware). Just the act of viewing a web-page that harbors this malicious code is enough for the attack to run. The downloaded malware often initiate a buffer-overflow attack. Buffer-overflow attack occurs when the downloaded malicious program or script deliberately sends more data to a target applications memory buffer than the buffer can handle - which can be exploited to create a back door to the system though which a hacker can gain access. The goal of most attacks is to install malware onto the compromised PC whereby the hacker can reformat the hard drive, steal sensitive user information, or even install programs that transform the machine into a Zombie PC. There are many types of buffer overflow attack, including stack attacks, heap attacks and ret2libc attacks. In each case, the goal is to destabilize or crash a computer system by deliberately causing a buffer overflow - creating the opportunity for the hacker to run malicious code and even gain control of the entire operating system. As would be expected, the applications most vulnerable to a buffer overflow attacks are those whose primary function involves Internet connectivity - such as web-browsers, e-mail clients and instant messaging applications. Non Persistent: The malicious script, passed by the attacker e.g. through the HTML forms, can place hidden frames or deceptive links on unrelated sites in the web content of the legitimate serve. 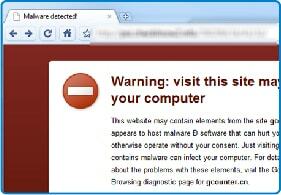 This can cause victims' browsers to navigate to a malicious site automatically - often completely in the background. In such a case, the attacker can intrude into the security context and steal them from the victim's browser. Persistent: The malicious script, passed by the attacker e.g. through the HTML forms, is saved in the server and displayed permanently in the normal pages rendered to the visitors. This enables the attackers to hijack the transactions through the legitimate server and can steal sensitive information like authentication passwords, credit card numbers, billing information etc. What should I do if I discover an infected site? If you find a site with malicious content, please report your network administrator or your ISP along with the URL of the website. Also include the information that you discovered these threats by using Comodo Web Inspector scanning service, available in your report (Report as Malicious). This will enable the administrator or the ISP to rescan the reported website(s) and to take necessary actions based on the scan reports to safeguard the visitors of the website. How will I know that my website is blocked by search engines? If we find that your site is blacklisted, we will immediately alert you via the email address registered with us along with your account. How do you identify that malware has invaded into my site? We scan all the files in your website with our award winning scanning engines and the very latest database of known malware in order to identify even zero-hour threats. Will you be able to identify invasion of malware before the search engines do? Your website will be scanned for malware and malicious changes everyday, while the search engines do the same over much longer intervals. Hence, we may identify the malware before the search engines do. How will you notify me if you find malware in my site? Immediately after finding malware we will alert you through email at the email address registered with us during account creation. This will enable you to take necessary remedial measures to disinfect your site and prevent being blacklisted by the search engines. How does Web Inspector work? The Vulnerability & PCI Scanning Extension: This dedicated dashboard revolutionizes the way you test your website's security. This will give you a daily vulnerability scan and scanning to be PCI compliance.